ALBANY – Edward G. O’Brien, 81, of North Albany passed away at home on Friday, February 17, 2017. Edward was born in Cohoes on March 20, 1935 and was the son of the late Adele Potyrala O’Brien and Edward O’Brien. He served in the US Navy and retired from the NYS Department of Labor. 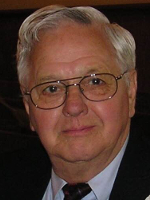 He was a devout communicant of Sacred Heart Church in North Albany. Edward was predeceased by his daughter, Elaine O’Brien Pettit and his sister, Carol A. Tierney. He is survived by his beloved wife of 59 years, Mary Davis O’Brien of Albany; his son Timothy (Lisa) O’Brien of Colonie; his daughters Karen (Jay) Driscoll of Albany, and Christine O’Brien Inger of Delmar; his son in law Derek S. Pettit of Albany; his loving grandchildren Conor Driscoll, Margaret Driscoll and Jack Driscoll of Albany, Julia Pettit of Albany, and Kathleen Inger of Delmar. Edward is also survived by several nieces and nephews. A memorial mass will be held on Saturday at 10:00 a.m. at Sacred Heart Church in North Albany. There will be no calling hours as Edward’s wishes were to have his remains donated to Albany Medical College’s Anatomical Gift Program. Those who wish may send a remembrance to Sacred Heart Church Food Pantry, 33 Walter St., Albany NY 12204; or to Stride Adaptive Sports, 4482 NY Highway 150, West Sand Lake, NY 12196. To leave a message of condolence for the family, please visit www.HansFuneralHome.com. Christine and family, I am so sorry for your loss. Remember all the good times you had together. Speak his name and he shall forever remain in your heart…..
With deepest condolences. You will be missed, Mr. O’Brien. God bless you and your family at this time of deep sorrow. I am so saddened by the passing of your Husband & Dad, Also for one of the Lector’s at Sacred Heart Church. He sure will be missed dearly. he was so full of fun, whenever he spoke to you, always had something funny to say. Well he is at least out of his sufferings, and I am sure he is up with Our Lord & Savior JESUS CHRIST. From all of us at TJ’s Cafe you will be truly missed! Our sincerest thoughts are with you and your family, god bless. Todd& Joelle & the staff at TJ’s. I have so many wonderful, funny memories of Mr. O’Brien (Eddie Spaghetti) from our days of Cobb’s House of Meats and beyond. He was like a second father to me. I loved going to the O’Briens’ after Christmas Eve mass at Sacred Heart. Some of my best childhood memories were made with the O’Brien family! I am so sorry to hear of Ed’s passing. My deepest sympathy to all of you. We are in Florida and Derek informed us of Ed’s passing. Ed was a very friendly and kind man. Our thoughts and prayers are with you and your family at this sad time. Please accept my sincere condolences at this sad time. Ed was a GOOD man whom I had the pleasure of working with for decades. I’ll always remember the Christmas parties held at the O’Brien household with Ed and Mary hosting and dozens of co-workers in attendance. May he rest in peace! We will miss him so! Our love to all of you!!! My sincere condolences, Mary, to you and yours. Many wonderful memories of time spent working together and sharing life will remain in my heart forever. My thoughts are with you, and my prayers are to God to comfort all of you. SO SORRY TO HEAR ABOUT YOUR LOSS MY CONDOLENCES TO YOU, KAREN AND ALL OF YOUR FAMILY.